This website strikes at the core of something very important to me – showing appreciation to those who serve to protect our country and our communities. 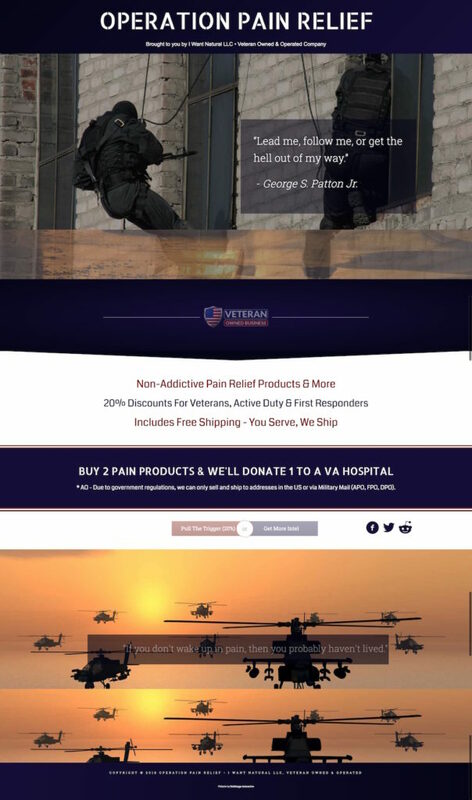 Operation Pain Relief was launched as a discount program by I Want Natural LLC, a veteran owned and operated company, whose owners are my dearest friends. We all wanted to do something to show our gratitude to veterans, first responders, and their families, so we launched this program just for them. There is no fee to join. They just sign up and enjoy savings and free shipping on anything that I Want Natural sells now or rolls out in the future. The flagship product is a non-addictive pain relief product. The opioid crisis was a key driver in our timing of this program. Please share with your friends and families who serve. Thank you!